Kolab uses IMAP server not only for e-mail but also for address book (contacts) and calendar (appointments). These entries are stored in special directories. Kolab comes with GNU GPL and other free software licenses and is for highly scalable environments. In this article we will discuss about Kolab in brief and in future article we will show how to install Kolab on your server. It is important to understand the unique features offered by Kolab before the actual deployment. 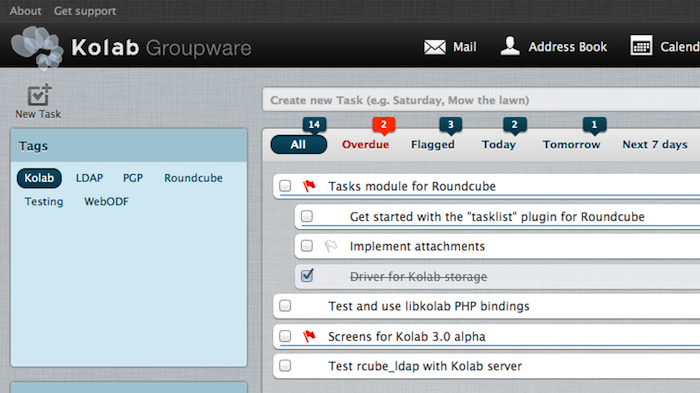 Kolab is a free groupware solution. It consists of the Kolab server and related interface implementations in a wide range of available Kolab clients. Kolab buildsthe software and the concepts that have been defined by the Kroupware Contract and the Kolab format. Kolab was a commissioned work for the Federal Office for Security in Information Technology in 2002-2004 and has been developed for a heterogeneous environment. The special feature of Kolab is the underlying idea, one IMAP server is used not only for e-mail. These entries are stored in special directories, IMAP, the IMAP server manages access rights ( ACLs ) and the client synchronization, also IMAP folders jointly and simultaneously can be used by multiple clients and users. The configuration and management of a Kolab server is largely using LDAP. Kolab clients and servers use well established standards including vCard, iCal, XML and as already mentioned, IMAP and LDAP. This set of standards for protocols and formats, which is specified in the open Kolab format, allows different PIM applications to exchange Groupware-/PIM-Data to serve. You can read the basics on Mail Server, POP3, IMAP and SMTP in case you need for in depth understanding. Cite this article as: Abhishek Ghosh, "Kolab : A Free Groupware Solution for Professional Deployments," in The Customize Windows, July 6, 2013, April 26, 2019, https://thecustomizewindows.com/2013/07/kolab-a-free-groupware-solution-for-professional-deployments/.